Print — Crest Communications, Inc.
Touching your audience from a variety of platforms is so important. Digital delivers this in many ways, but there is nothing like making your mark between the folds of your target audience's trusty newspaper and magazine, or on their mailers and menus. The list of print options goes on and so does your opportunity to drive consumer action. Hinsdale Nurseries provides a quality product and you get what you pay for. It was our job to inform the audience why it's so worth it. With an over-arching focus on the creativity that's born out of developing your yard, this campaign portrays the business's over 150 years in the nursery business, how that's developed their tools and techniques in consideration of local specificity, and the importance of community and history along the way. 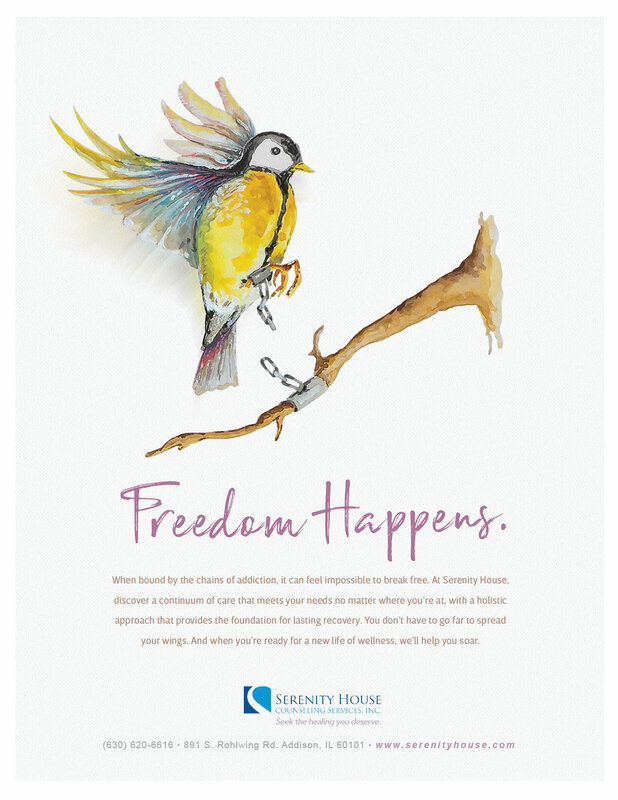 This campaign for Serenity House Counseling Services, Inc. used a light watercolor approach to reflect the delicate nature of the industry of substance and alcohol abuse. Depicted is the program effectiveness—for lasting recovery, the expertise and understanding of staff, the holistic method in which healing is approached, and community integration. Typography and copy represent the way AGAD Pest Control handles client pest issues: quickly, concisely, and boldly. So bold, in fact, they've got canine expertise on staff. Known fact: viewers respond to cute, fluffy things. But in this campaign, we had a real-life, cute, and fluffy expert—and clear opportunity to inform and connect with audiences. AGAD Pest Control brings Nyx, an officially-trained, bed bug detection dog to consultations to confirm bed bug infestation from the start. This series quickly turns the orginally cute and fluffy pup into a money-saving, reliable expert. When it comes down to the bare bones of it, we're all made of the same stuff. 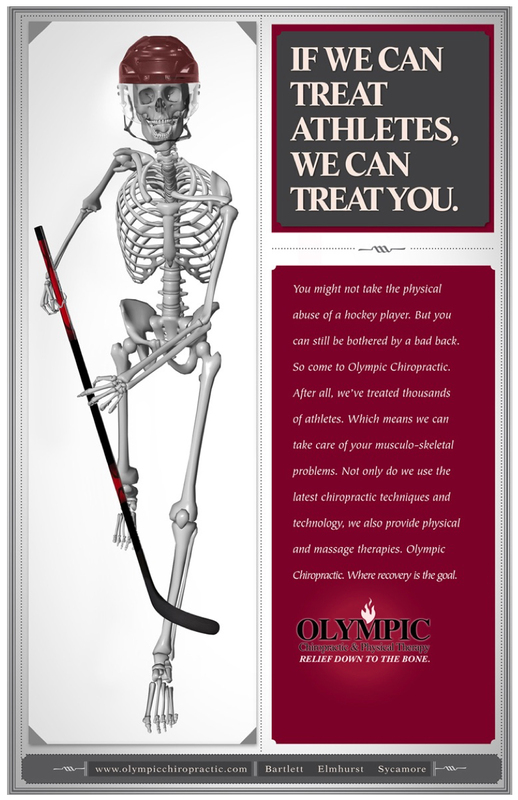 With Olympic Chiropractic and Physical Therapy, we made that easily translatable. There, you're in the hands of doctors who specialize in athletic physical therapy, treating the deepest injuries imaginable, which means the suffering consumer can logically conclude that hope lies ahead. 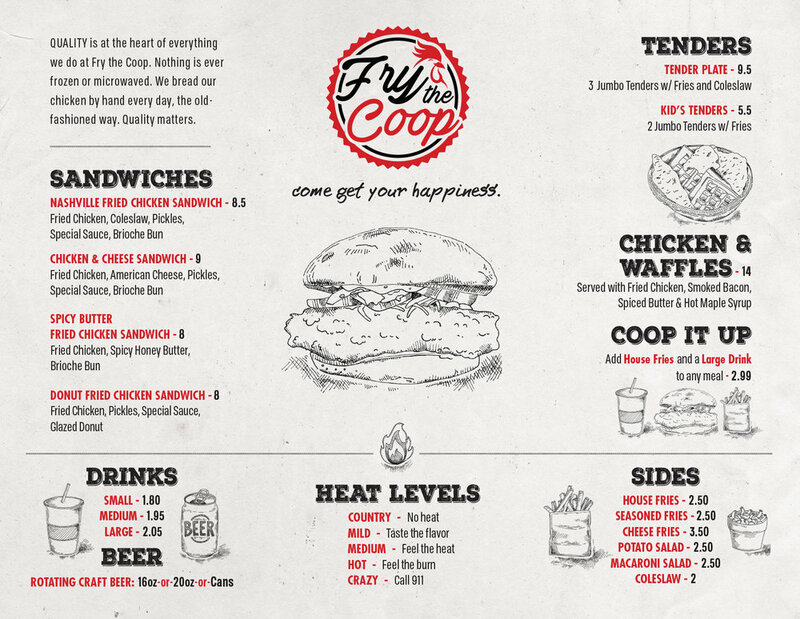 Fry The Coop's menu is unique and simple. The staff are warm and friendly. And, the environment is welcoming and comfortable. So, we brought hand-drawn, original artwork to depict that simplicity and down-home, southern comfort that feels relatable and as cool as the crew working there. In this campaign for West Suburban Bank, typography says it all. The bank is simple, warm, community-driven, and great at what they do. These ads make that loud and clear with brief messaging and parenthetic phrases to represent their conversational, friendly style. Evergreen Bank Group prides themselves on the top-notch rates and technologies, but that doesn't take away from their personable, involved community-centric side. The balance of those factors is unique and keeps customers shining bright with satisfaction. Hence, a boldly-colored campaign that also facilitates triangles to represent the upward movement towards their financial success.